For 50th reunion pictures, go to '50th Reunion Photos' and 'Photo Gallery' on left menu. Photos from our 70th Birthday Bash are in the 'Photo Gallery,' as well. All too soon, yet another classmate has died. Log in to the 'What's New' page (see menu at top) to find more information. Kahdy Scholarship Gifts: The lists of donors have been updated and are accurate through March 2018. To visit the lists, go to 'Kahdy Scholarship Program' on the left menu and then click on each of the three links to access the lists of names for each category. How Can I Contact a Classmate? If you want to contact a classmate, go to 'Classmate Profiles' on the menu above. Find the classmate's name and click on it. At the bottom of that profile is a choice of 'Send a Private Message' or 'Leave a Comment.' If you choose 'send a private message,' no one else sees it! Remember to order Don's book today. 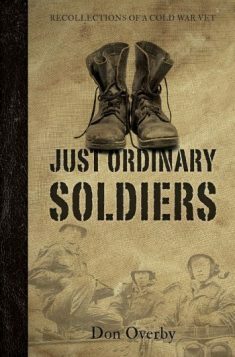 It tells the story of the men with whom Don served in Germany during the Viet Nam years. 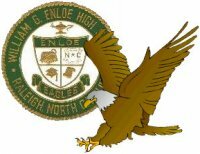 Enloe Alumni Association: Kaye Lloyd Gattis has suggested we look for the 'Enloe Alumni Association' website on Facebook and that each of us consider joining. She reports that the current principal is 'working hard' to build it. As we as a class move forward in time and in age, it seems a good time to look back at years long past. So, take a few minutes, click on 'Hugh Morson' on the left menu, and reminisce about our years there and read a bit of the school's history. "It was an honor and great privilege to attend your reunion. Your committee did a wonderful job. Thank you, thank you, and best wishes always. George K." At the reunion, Mr. Kahdy was presented with a framed pen and ink drawing of EHS done by class member Linda Poole Fitz-Simons. The mat surrounding the picture was signed by all classmates in attendance. Select Classmate John Adams Robert Allen Dusty Anderson Frani Angell Patrick Austin Ruby Bagwell David Bailey Dwight Ball Jackie Barnette Rusty Batten Marjorie Benson Lucille Bonnell Ken Bowen Larry Boykin Barry Bradshaw Kaye Bradshaw Jeannie Britt Bill Bruner Nancy Bullock Jim Butler Beverly Byrum Chris Cain Margaret Marie Cannon George Carroll Kathy Carter Vann Carter Hampton Casebolt Barbara Jean Cash Annette Clark Jerry Collins Marilyn Cooke Jo Ann Cooper David Cotton Rebecca Cowan Ann Cox Karenn Cox Wayne Crawford Urbanna Cromartie David Davis Kay Davis Dale Denning Larry Doster Pat Earp Cheryll Eason Gene Eason Paul Ellington Ashby Elmore Bill Faison Al Fields Gaston Floyd Ed Fogg Oliver Frady Emory Frazier Ken Gammon Hilda Garris Linda Godwin Tommy Graham Bonnie Griffin Archie Gupton Mike Hamby Mike Harvell Ken Haskins Bill Heath Linda Heath Robert Heath Ann Hendricks Jo Ann Holder Ben Holland Robert Holt Ann Honeycutt Rick Honeycutt Tommy Honeycutt Brenda Horton Donald Jefferson Bucky Johns Ronnie Johnson Linda Jordan Lloyd Joslin Steve Kaufman Ned Kinsey Linda Kliewer Betsy Knott John Kuper Donald Langdon Bob Larrison Julia Lassiter Donna Lawson Barbara Ann Lee Freddie Lewis George Lisenbe Kaye Lloyd Judy Lyles Richard Mann Bill Massey Linda Matthews Sharon McDonald Darleen McEvoy Brenda McGhee Donna McKinney Ronnie McLean Terry Lee McLeod Doug Miles Dehlia Miller Phil Mobley Becky Moore Sam Moore Ron Moxley Ray Mozingo Richard Munns Ellen Murray Naomie Nelson Judy Orr Don Overby Billy Parker Connie Parker Clyde Parrish Jerry Paul Louise Peele Shirley Penny Robert Perkins Vicki Pierce Olan Pike Judy Poole Linda Poole Starr Ray Lacy Reaves Doug Repass Barbara Richardson Glenn Richardson Pat Richardson Margaret Anne Riggan Jim Robbins Sheryl Marie Robertson Kathi Rogers Dale Ross Michele Rotchford Sherry Sanders Everett Scott Steve Shellenberger Glenn Smith John Smith Nola Elizabeth Smith Paul J. Smith Steve Smith Jim Snakenberg Annette Snipes Teresa Ann Spears MaryLou Spence Stanley Stell Dennis Steorts Gray Stephens Richard Stevenson Kay Straughn Bobby Sutter Ken Taylor Roy Teel Lynn Thompson John Tolle III Margaret Ann Tucker Frank Tyndall David Walker Rick Wall Donna Ward Judy Watkins Bill Wheeler David White Nancy Whitley Lavon Wilkinson Dale Williams Larry Williams Donna Kaye Wilson Glenwood Yopp, Jr.